All southbound lanes on U.S. Route 301 have reopened after a crash involving multiple, overturned vehicles stopped traffic in Prince George's County, Maryland, on Monday. 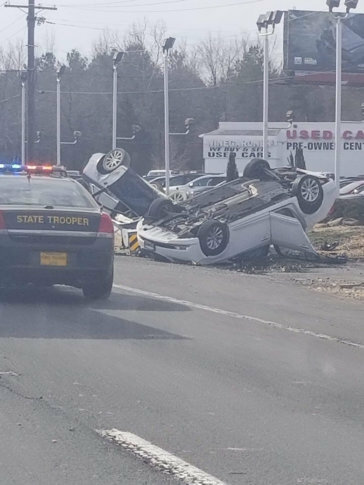 WASHINGTON — All southbound lanes on U.S. Route 301 have reopened after a crash involving multiple, overturned vehicles stopped traffic in Prince George’s County, Maryland, Monday afternoon. All lanes reopened around 1:40 p.m., but some delays persist. The crash happened between Chadds Ford Drive and the Md. Route 5 merge. Callers who said they witnessed the crash told WTOP’s Traffic Center that vehicles were overturned, and there were serious injuries. Visit WTOP’s traffic page for the latest updates, follow WTOP on Twitter @WTOPtraffic, and listen to live traffic reports every 10 minutes on 103.5 FM or via the online stream. Below is a map of the area where the crash happened.